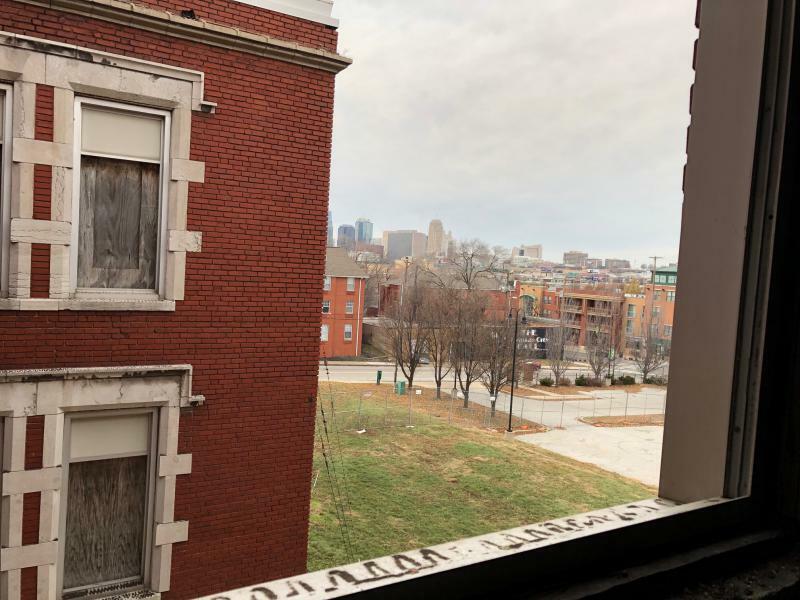 Kansas City Arts advocate Allan Gray takes a call inside the former Attucks School. On stage at 18th & Vine's Gem Theater on Sunday, images flashed across a screen: the artists ShanZuo and DaHuang Zhou, dressed mostly in black wearing fedoras; their abstract paintings and sculptures; gallery-goers in Chicago; and candid shots with former president Barack Obama, who commissioned one of their works as a gift to the president of China. The event marked an agreement between the Chicago-based Zhou Brothers and Guangxi University of China. The Zhou Brothers, as told by a translator, described their vision: "We plan to build the Kansas City art center into a multi-dimensional art exchange platform." About 5,000 square feet in a new Zhou B Art Center in Kansas City would be allotted to Guangxi University for studios, exhibition space, and apartments for visiting artists, professors and scholars. 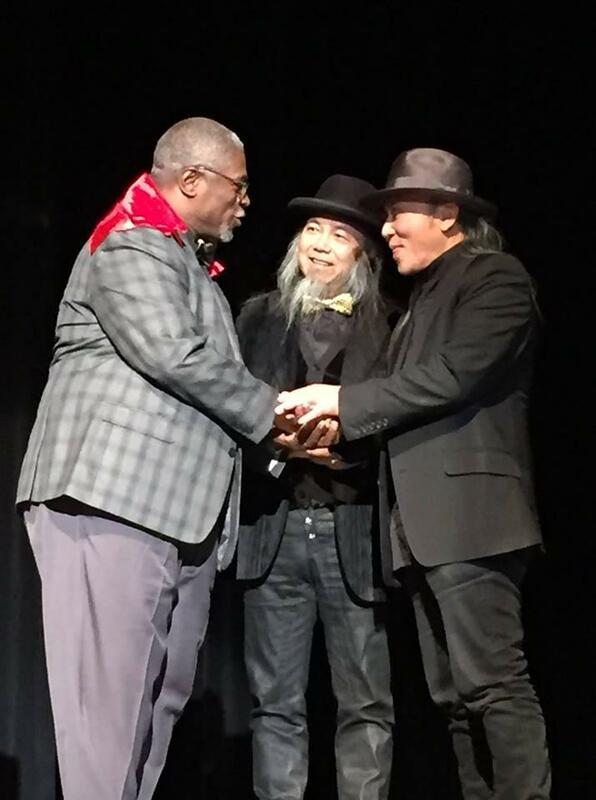 Kansas City Mayor Sly James greets the Zhou Brothers at the Gem Theater. "Through this exchange we’re going to be happy to welcome Chinese students who will become part of this community," said Kansas City Mayor Sly James. "I’ve always thought that one thing we could do more of is have more international diversity in this city." The two-story brick building opened in 1905, with an addition in 1922. It's listed on the National Register of Historic Places. Earlier in the month, Allan Gray untangled the heavy chains wrapped around the doors and unlocked the padlock. "Well, you can never have too much security, right?" he said. In March, the city of Kansas City finalized the sale of the vacant building to the Zhou Brothers for $100. The city chose this proposal over a few others because of what officials described as "tourism potential." 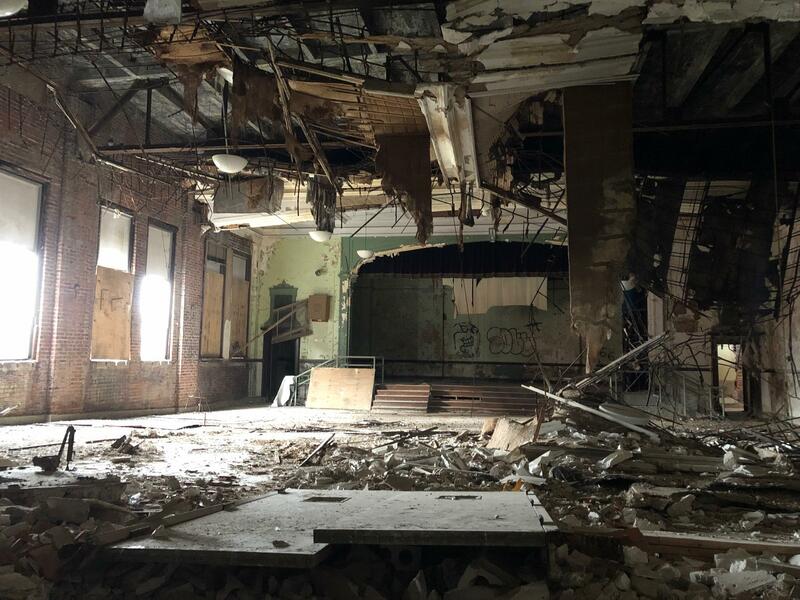 A view from inside the former Attucks school. Gray, a longtime arts advocate, was tapped as the local owner’s representative. On a recent walkthrough, he flashed his cell phone light to illuminate some of the dim spaces. Classroom walls and old-fashioned low ceilings have been stripped away. There’s exposed brick, and piles of plaster on the floor. "I also see a building that, but for neglect, has been given a second chance," says Gray. "The whole building has been going through a transformation as we pull away the different layers ... As they say in the industry, the building has good bones." Gray said he first connected with the Zhou Brothers about 25 years ago, when he was in Chicago for a conference. As he recalls, he stopped by the artists’ studio for a tour, at the wrong time. "But they were very gracious," he said, "and I remember the warmth, the conversation, as they allowed me to enter into that inner sanctum of their creativity and to observe them in that short period of time." Plans call for the old auditorium to be turned into a 150 to 200-seat theater for theatrical and musical performances. ShanZuo and DaHuang Zhou grew up in the Guangxi Province of China. They studied art in Shanghai and Bejing, and moved to the U.S. in 1986. In 2004, they turned a rundown warehouse in Chicago, into the Zhou B Art Center. A second art center is in the works in Bejing. Gray said when he met up again with the Zhou Brothers a few years ago, talk turned to a third location in Kansas City. "There was something about the building that captured their eyes," according to Gray. At the event earlier this week, James said the agreement marks an exciting development for the district, which earlier this year saw the opening of the Kansas City Urban Youth Academy baseball facility, and several million dollars of infrastructure improvements. "This art center is going to feature galleries, art studios, exhibition space, dance, studios, a café, and more," he said. Correction: The Zhou brothers' first names were misspelled in an earlier version of this story. They have been corrected. The historic Attucks School building in the 18th & Vine Jazz District won’t be reused as a school after all.